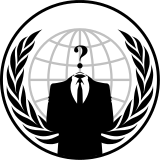 Today, We will Talk About biggest Anonymous Hacker Group. vigilantes that becomes apparent with their Guy Fawkes masks. but for this you only need a guy fawkes mask. being allegedly belonging to Anonymous.